Thousands of extra motorists hit Surrey’s roads in the rush hour as the summer holidays end and children return to school, figures reveal. According to the latest county council statistics for 25 roads across Surrey*, traffic rose by more than 13% in September compared to the previous month. They show that an average of nearly 37,000 vehicles used the roads between 8am and 9am throughout the month compared to just over 32,500 in August. 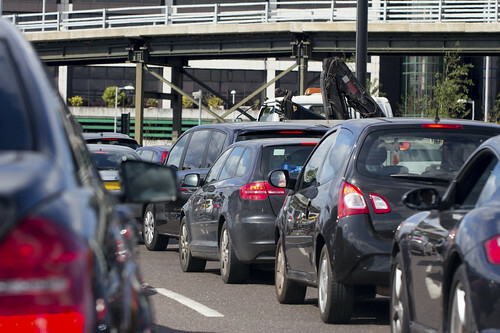 The news comes after it was revealed that Surrey has the slowest rush hour roads of any county in the country as the council continued a push for a share of a new highways fund from Vehicle Excise Duty. Chancellor George Osborne announced the fund in the latest budget but the council revealed that the small print indicated that the money will only be spent on motorways and major A routes managed by Highways England, which cover only 100 miles of Surrey. It means the 3,300 miles of roads the county’s residents and businesses use every day will not benefit even though there are significantly more miles driven on them than those earmarked for the cash. John Furey, Surrey County Council’s Cabinet Member for Highways, said: “While thoughts of classes and homework might be occupying children’s minds, local drivers are no doubt more concerned with the school run traffic. * Figures from automatic vehicle counters on roads including the A22 Godstone bypass; A31 Farnham bypass; A30 London Road, Camberley; A23 Horley Road, Redhill; A25 Epsom Road, Guildford; A24 Leatherhead Road, Ashtead and A217 Cockshott Hill, Reigate. Statistics recorded in 2013.